In October 2015 the Syrian Refugee Resettlement Service had got off to great start. User researchers had done some excellent discovery work to paint the general picture of the existing Syrian refugee resettlement process in the UK. However, since the team had no service manager, we were at quite a disadvantage. We had no one to advocate us and the work we wanted to do with the resettlement case-workers, who themselves were under considerable pressure to resettle a large number of Syrian refugees. As an interaction designer, drawing an existing or proposed process is one of the first activities I engage in when starting on a project. It starts as a rough-pen-on-paper drawing, and tends to involve lots of scribbling, crossing out and sticky-tape. The aim is to end up with a high-fidelity digital process map that can be printed at high resolution and digitally shared. The benefits of drawing an existing process are twofold: firstly, it helps us understand the existing work and data processes, all the actors involved in this process, and all the interdependencies. Secondly, it becomes a useful engagement tool for stakeholders and users. 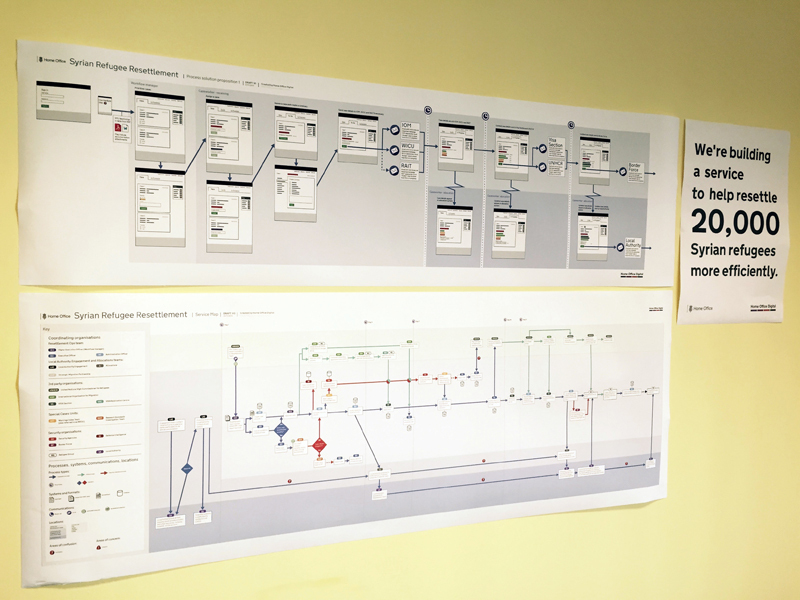 A process map is often a great way to engage with stakeholders – as up to that point, a lack of design skills and tools has meant the process itself has only ever existed as a concept in their heads. I collaborated with the whole digital team to sketch the map. I then made a digital version and spoke to one of the resettlement team leads to get his feedback. He immediately realised the power of the map and how visualising the existing resettlement service could benefit his team. Due to the sensitive nature of this service, we're unable to show a detailed rendering of the process map. The resettlement team lead saw we were there to work with him and his case-workers, and ended up using the process map to train new team members. He later asked for more copies to be printed – both to put up in the office and to use as an engagement tool for other parts of the business! I made sure that the map was highly visible on the project wall in our central Westminster office, to show the progress of the project. I subsequently received requests from other areas of the business to use this map as a template to illustrate the processes involved within their services. This same process map became invaluable once again at a later stage, when engaging in a service mapping exercise to develop a service size scope for a presentation and workshop. I later reflected how interesting it was that this process map took on a number of different purposes throughout the initial project cycle. Some clichés are so true. You know the one I’m referring to.